Sorry, this item is sold out and no longer available. Riedel O Stemless Wine Glasses - 8 glass mixed set. The Riedel Stemless O Wine Glasses are the newest revolution in glassware. Casual yet elegant, these wine glasses are appropriate for fine wine enjoyment, as well as casual sipping. The wine glasses were shaped to fit into a dishwasher and fine-tuned to enhance the pleasure of your favorite wine varietals. In keeping with the Riedel glassware tradition, these wine glasses have become the benchmark for stemless glassware. Machine made in Germany of lead-free crystal. Gift boxed in sets of 2. Dishwasher Safe. 4 Cabernet/Merlot Glasses - 4-7/8"H x 2-13/16" Dia., 21-1/8 oz. 4 Chardonnay/Viognier Glasses - 3-7/8"H x 2-1/2" Dia., 11-1/4 oz. Overall Height: Cabernet/Merlot - 4-7/8"; Chardonnay/Viognier - 3-7/8"
Mouth Diameter: Cabernet/Merlot - 2-13/16"; Chardonnay/Viognier - 2-1/2"
Capacity: Cabernet/Merlot - 21-1/8 oz. ; Chardonnay/Viognier - 11-1/4 oz. BEST ANSWER: If you purchase this set we do not but if you purchase the 4 pack of each kind of glass yes. Please see the below link. They seem delicate so it is possible they may break easy, but so far I've used them almost every night, put the in the dishwasher and they are fine. They are comfortable, look great, and hold a nice amount of wine! These are nice glasses. I especially appreciate that they fit well in the dishwasher. The smaller glasses seem very sturdy. The larger glasses seem a bit more delicate. I don't know yet how well they will hold up to frequent use since I have only had them for a few weeks. The glasses are top notch. This was purchased as a gift. [...] The recepient was very pleased with the gift---it was a perfect experience all around. A shout-out to customer service. One of the glasses arrived with a chip in its lip. I called customer service, who were helpful and polite and immediately shipped a replacement glass, which arrived the next day. Alas, it was the wrong glass. After another helpful and polite conversation, I was immediately shipped a boxed package of two of the correct glasses. Great work, folks. I would happily shop here again. It's great to have glasses that enhance the wine AND are dishwasher safe. The shape of the glass brings out the best taste in the type of wine you are drinking. Without the stem they are less likely to break when washing. The glass is thin but meant to be. I love them. I bought them for my husband for our anniversary. He loves them for bringing out the best taste of the wine. We love these stemless wine glasses. The glasses came in a few days. One of the glasses had an air bubble and when I called, it was replaced immediately. No hassle! They told me to just dispose of the glass they replaced. This company is a pleasure to deal with! Riedel Glassware Products are beautiful - they are lovely to hold in the hand. I own several different Product Lines and, yes, I have broken several over the years, but I continue to restock my supply because I find them superior to most of the other glassware available. Riedel Glassware just makes the enjoyment of wine all the better. If you talk with your hands, you'll appreciate this glass's ability to "roll with a gentle push". I gave these as a wedding gift, and I know they will like them. 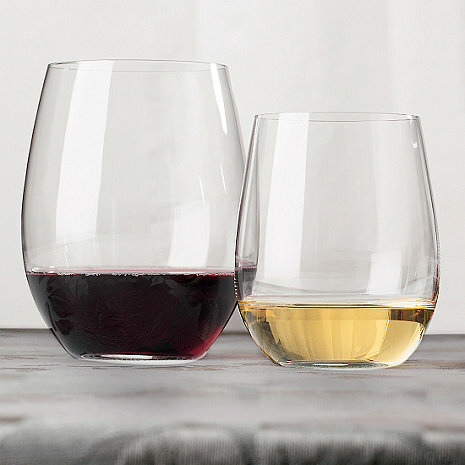 Since Riedel sells so many different stemless glasses in the "O" collection, this is a great way to buy all purpose red and white glasses in a bundled set at a very attractive price..
Makes a perfect gift for that "hard to buy for" person who has everything. Delivery ws prompt and my glasses arrive in perfect shape. [...] broke while my maid was hand washing it: it fell over in the sink.I had dreamed of owning Riedel glasses for some years but has been deterred by their cost, their fragility and their size, which made handwashing necessary. The "O" series promised a solution and I hope it still will. In the meantime, it still requires intensive care. Appear fragile but are dishwasher safe. They appear to be fragile but have been dishwasher safe so far. Larger cabernet glasses may be more difficult to hold for smaller hands. Very nice glasses. Definitely worth it. [...] these are great glasses. Fit well in the hand and very stylish. I just ordered a set of the Happy O wine glasses to complete my set. great artsy glass, not so elitist looking. The Cabernet glasses are fine. The Chardonnay glasses are too small. I could have bought twice as many glasses for practically the same price (and not wait weeks for the back order) at Bed Bath Bath and Beyond. One of the Riedel 'O' Stemless Cabernet glasses broke the FIRST time we put it in the dishwasher, despite our efforts to be particularly careful with our new purchase.